ABBO (ABBON), St. Abbo entered the Abbey of St. Benoît-sur-Loire (Fleury Abbey) as a child for education and following its completion received monastic tonsure there. He went on to study at Paris and Rheims. In 985 he was invited by St. Oswald (28th February) to take charge of the monastery school of Ramsey, whilst also assisting St. Oswald in the restoration of monasticism in England. St. Abbo spent two years at Ramsey during which time he wrote the Passio S. Eadmundi . Returning to Fleury in 987 and was elected Abbot the following year. Not merely one of the most influential theologians of his day, St. Abbo was a true polymath, producing significant works on grammar, computus, logic, mathematics, and astronomy. He was a supporter of the Cluniac Reform, as well as a passionate defender of both Papal authority and of the freedom of the monasteries from interference both temporal and episcopal. St. Abbo was killed in 1004 whilst attempting to quell a riot caused by reforms he instituted at the dependency priory of La Reole in Gascony, and was immediately venerated as a martyr. ARCADIUS, PASCHASIUS, PROBUS, EUTYCHIAN, and PAULILLUS, Protomartyrs of the Vandal persecution in Africa in 437. 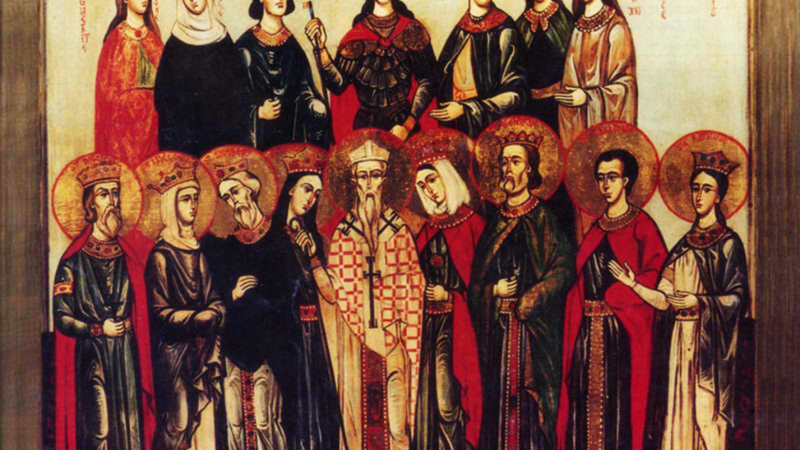 These saints were Spaniards who were exiled to Africa by the Arian Vandal King Genseric. Paulillus, only a child, the younger brother of SS. Paschasius and Eutychian was spared death, though he was flogged and sold into slavery, hence is counted amongst the martyrs as well. BRICE (BRITIUS, BRIXIUS), an orphan raised by St. Martin of Tours (11th November) whom he later ordained to the priesthood. St. Brice was a vain and overly ambitious cleric, who, more than once, was accused of licentious behaviour. Though chosen to succeed St. Martin as Bishop, the faithful of the diocese would not have it and St. Brice was driven into exile. Whilst in exile he repented, reformed his ways, and was cleared of wrong doing by official ecclesiastical investigators. With the news of his change preceding him, St. Brice returned to Tours, and having witnessed his conversion his flock immediately proclaimed him a saint upon his repose 444. CAILLIN, (Seventh Century), a disciple of St. Aidan of Ferns (31st January) in Ireland. According to tradition St. Caillin once turned a group on unbelieving Druids into stone. CHILLIEN (KILIAN), (Seventh Century), an Irish relative of St. Fiacre (30th August). Returning from a pilgrimage to Rome, St. Chillien stopped to spend time with St. Fiacre, and was then commissioned by St. Faro of Meaux (28th October) to evangelize in Artois. His mission was very fruitful and he even founded a monastery at Aubigny-en-Artois, where his relics were later enshrined. According to some, St. Chillien was a bishop, though the extant records are inconclusive. He is also said to have been offered the papacy, though he declined in humility. If true, this would make him the only Irishman to which the Bishopric of Rome has been offered. COLUMBA, (Sixth Century), known to us through the dedication of two parishes in Cornwall and a manuscript dating from the reign of Elizabeth I (A.D. 1558 – 1603) which is said to be based upon local tradition. According to the manuscript, St. Columba was the daughter of pagan King Lodan and Queen Manigild (probably of Lothian, Scotland), and St. Columba became a Christian when the Holy Ghost appeared to her in the form of a dove. When her parents betrothed her to a pagan prince, St. Columba refused to marry him resulting in her parents having her imprisoned. An angel intervened and helped St. Columba escape and take a ship to Cornwall. Unfortunately, the prince pursued her, through Cornwall and captured her at Ruthvoes (3.2 km / 2 mi) south of St. Columb Major. There St. Columba was decapitated by the prince and a spring gushed forth along the path of her fallen blood. Baring-Gould was of the opinion this saint was actually St. Columba of Tyrdaglas (12th December) who was a male disciple of St. Finian of Clonard (12th December) and later Abbot of Tyrdaglas in Munster. However, there is no evidence to support his theory. St. Columba is the patron of the Churches of St. Columb Major, and St. Columb Minor in Cornwall where her feast is kept on 11th and 15th November respectively. DALMATIUS, an early (possibly third) Bishop of Rodez in southern Gaul. Though subjected to relentless persecution by the Arian King Amalric, St. Dalmatius shepherded that See from 524 until his repose in 580. DEVINICUS (DENICK, TEAVNECK), (Sixth Century), a native of northern Scotland who in his old age joined SS. Columba (9th June) and Machar (12th November) in their missionary work. He is believed to have been a bishop, and is remembered for his evangelisation of Caithness. EUGENIUS (the YOUNGER or II) of TOLEDO, a monk at Abbey of Santa Engracia in Zaragoza, Aragon, who, in 646, was consecrated thirty-first Bishop of Toledo, succeeding Eugenius I. St. Eugenius was a signatory of the Acts of the fifth Council of Toledo (A.D. 636), in addition to being a man of great piety and learning, both spiritual and temporal, he was also an accomplished poet and musician. St. Eugenius reposed in 657. GREDIFAEL, (Seventh Century), a native of either Brittany or Wales, who accompanied St. Paternus (15th April) to Wales. St. Gredifael is said to have been Abbot of Whitland in Carmarthenshire, south-west Wales, and is also the patron saint and founder of St. Gredifael's Church, Penmynydd, in Anglesey, Wales. MAXELLENDIS, a native of Caudry, near Cambrai was betrothed by her parents to a local nobleman. Desiring to enter monastic life, St. Maxellendis refused to marry, and was stabbed to death by her husband to be, circa 670. MITRIUS (MITRE, METRE, MERRE), a Greek slave in Aix in Provence, he was routinely and savagely abused for being a Christian by his pagan master and fellow-slaves. In 314 St. Mitrius was beheaded. QUINTIAN, a priest in Carthage who fled the Arian-Vandal persecution there, settling in Gaul, and in 487 he was consecrated Bishop of Rodez. Later exiled by the Arian Visigoths, St. Quintian settled in Auvergne where he succeeded St. Euphrasius (14th January) as Bishop of Clermont. St. Quintian reposed circa 527. VALENTINE, SOLUTOR, and VICTOR, martyrs at Ravenna during the Diocletian persecutions (circa 305).